When Ron Gardenhire was named as manager of the Minnesota Twins in early 2002, The New York Times wrote that Gardenhire just might get the dubious distinction of being named manager and then never managing a game. That was because Gardenhire was named amid the contraction controversy, with the Twins set to be one of two teams to be eliminated. Gardenhire, though, told The Times he was just happy to have the job. "I'll take it any way I can get it," Gardenhire told The Times. "There's not many jobs out there managing in the major leagues." Gardenhire eventually did get to take the field with the Twins, the club soon saved from elimination. And, far from being a footnote as a no-manage manager, Gardenhire hasn't left the field. Gardenhire has remained the manager of the Twins for 12 seasons since, and he is set to continue as manager of the Twins for 2014. In that time, Gardenhire has managed in nearly 2000 games. And, though he hasn't gotten the Twins to a World Series, Gardenhire has taken the team to six division titles, including titles in each of his first three seasons. He also won the 2010 league Manager of the Year award. Gardenhire's career in baseball began in 1979, taken by the Mets in the sixth round of the draft, out of the University of Texas. With the Mets, Gardenhire made AA Jackson in 1980, then AAA Tidewater in 1981. In September 1981, he made the majors. In 27 games for the Mets in 1981, Gardenhire hit .271 with no home runs. He returned for almost all of 1982, hitting .240 over 141 games, with three home runs. His first major league home run came in late-June 1982 in Montreal. "I just wanted to win," Gardenhire told The Canadian Press after getting that first home run. "We needed that more than anything else." Gardenhire continued playing with the Mets through 1985. In all, he got into 285 major league games over five seasons. 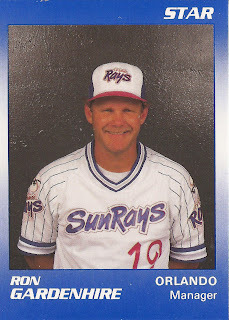 He played two more seasons in the minors, his last coming in 1987 at AAA with the Twins. It was with the Twins then that Gardenhire got his start in coaching. He managed 1988 at single-A Kenosha, then 1989 and 1990 at AA Orlando. Gardenhire then made the jump to Minnesota, as third base coach, just in time for the Twins' run to the 1991 championship. Gardenhire then coached under Tom Kelly for the next decade. Then, for 2002, Gardenhire took over Minnesota's top job upon Kelly's resignation. In his first season, Gardenhire's Twins advanced to the American League Championship Series, where they lost to the Angels. As the Twins prepared for the 2002 ALCS, team GM Terry Ryan recounted to The Los Angeles Times all the reasons why Gardenhire was the right pick for the Twins. "He was a loyal employee," Ryan told The Times. "He had worked with and developed many of our young players in the minors. He understood our organization, our philosophy, our budget, what we are about. He understood the community and its relationship to this team. He obviously understands the game and knows how to motivate players." In his first nine seasons as Twins manager, Gardenhire's Twins finished no lower than third place and finished first six times. His teams have fallen on harder times in recent years, finishing fifth twice and fourth in 2013. But his performances were enough for Gardenhire to pick up a new two-year contract in October 2013. In September 2009, as Gardenhire's Twins were closing in on their latest playoff birth, Gardenhire explained his managing philosophy to Yahoo! Sports. "As a manager, your job is to get the most out of a team and the players," Gardenhire told Yahoo!. "Put them in positions they can be successful and make it a comfortable atmosphere with some semblance of consistency and an idea we do things a certain way here." Gardenhire stayed with the Twins through 2014. For 2018, he signed on as manager with the Tigers.